There is a philosophy of European travel that says the actual place you stay in doesn’t particularity matter all that much. It usually goes a little something like this: “I’m not going all the way to Europe to stay in my room, and since I plan on being out all day sightseeing, all I really need is just a place to crash”. This can be true. Sometimes. Sometimes though, the places you stay end up being the sight that needs to be seen. Sometimes, you go home and tell people hings like “we stayed in the coolest place … “. Sometimes, the place you stay actually ends up making your trip. The Mountain Hostel in Gimmelwald, Switzerland is one of these places. 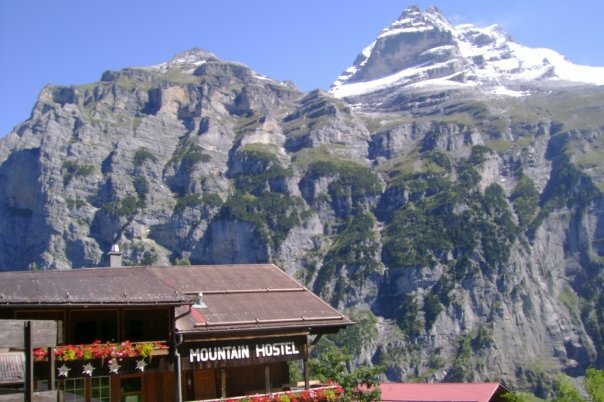 Without a doubt one of the coolest hostels in all of Europe, The Mountain Hostel Gimmelwald offers a glimpse of what you probably envisioned when the idea of going to Switzerland first crossed your mind. Gimmelwald (not to be confused with nearby Grindelwald) is a tiny village nestled up in the mountains in the Bernese Oberland area of Switzerland, not far from Interlaken. You can only reach Gimmelwald by taking a mountain gondola, and that is part of the fun and part of what keeps the village a tad bit secluded from the world. You won’t find cars in Gimmelwald, but once up the mountain and inside the hostel, you will find a rustic and jovial atmosphere full of travelers from all over the globe and jaw-dropping views of the Alps. During the day everyone goes out hiking, mountain-climbing, or lounging in flowery fields like a cow (ok, maybe that was just me), and then re-convenes to talk about the day’s alpine adventures over a beer or two at night. The Mountain Hostel Gimmelwald isn’t the most glamorous place in the world as it is a dorm-only wooden chalet, but for what it lacks in luxury, it makes us for with character and, uh, VIEWS LIKE THIS from the bedrooms. 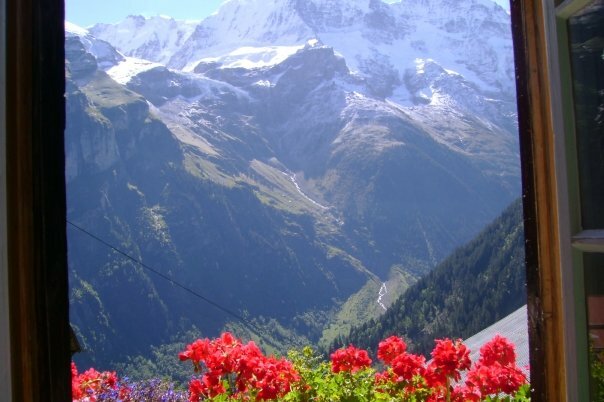 Even if you aren’t quite up for the dorm-style summer-camp atmosphere at the Mountain Hostel, you can opt to stay at one of the handful of B&B’s in Gimmelwald instead. You will still get to experience some of the magic of the Mountain Hostel though as you’ll likely go there for a beer and a pizza as there isn’t really anywhere else to go out in Gimmelwald. The Mountain Hostel is only open from mid-April until October 31st. During the winter, it is available exclusively for private ski rentals. Prices are pretty budget-friendly, at around 33 Swiss Francs per bed. 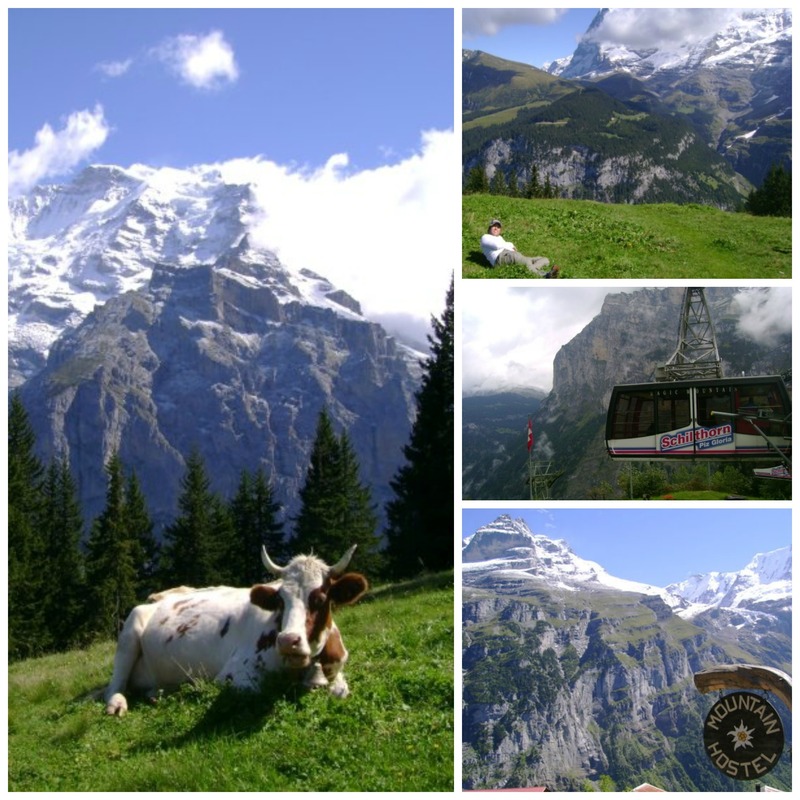 There are no supermarkets in Gimmelwald, but Murren is only a 40 minute hike away. Your best bet is to stock up on supplies in Interlaken on before you arrive.